So people are so inconsiderate. This actually happened to me in a slight variation. The nerve of some people! A cup of sugar is much less invasive. Great strip, Colm! signal pilfering is an epidemic!! Did anyone ever RETURN sugar? hmm… i’d like to think they would offer you some of the cookies/cake they were using the sugar for. that’s returning it …. in a different..more delicious way. thanks george! yeah, ive def heard a friend or two talk about trying to get in on neighbor’s wifi instead of having to shell out for their own internet. Awesome, been there myself. Cheers. I hate when my neighbors steal my WiFi. This comic made me angry! Then happy because of it’s wit. 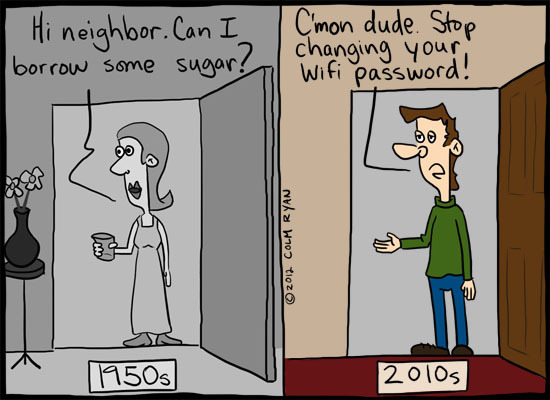 I actually had a friend who kept changing his neighbor’s wifi password – the neighbor never changed the default admin password.